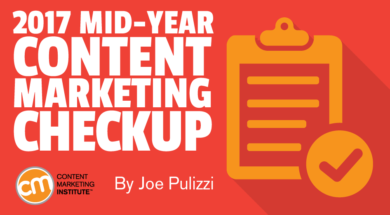 The months of June and July are the perfect time to reflect on your content marketing strategy. What’s working? What isn’t? What needs to change going into the fall season? As you complete your internal audit, here are some ideas and questions for consideration to help level up your program. If your internal experts or story contacts aren’t adept at writing, don’t force them to write. Use a professional writer to interview that person. Have the expert check over the information for accuracy, and then let the writer finish the piece. A few innovative companies that work with CMI have taken away all writing assignments from their employees and given them to outside writers. It saves on employee time, editing time, and, in most cases, produces content that is far superior. I find it fascinating that more companies don’t partner with non-competitive businesses on content marketing projects and instead choose to go it alone. By partnering, you can share the cost of the project and double up on distribution. Our website never would have happened in 2010 had it not been for five partners helping to fund and promote the content. IBM has been working on an internal influencer program for years, working to build up its employees into promising speakers and dynamic keynotes. Every company of any size should have a plan to find, nurture, and grow speaking talent. With corporate events on the rise, there are more opportunities to speak at events (and webinars) than ever before, but you should groom your experts in advance to take advantage of these opportunities. With companies like Airbnb and Lincoln Electric launching print magazines in the past 12 to 18 months, print, as a medium, is starting to heat up again. There may be no better way to break through the clutter of digital information than through a quality, consistent print magazine. Since your corporate management may find it difficult to understand why this strategy would work, you may want this to be one of those situations where partnering up to diffuse risk makes sense. In the past, when you visited a corporate blog post, it often didn’t have a sufficient call to action to encourage newsletter sign-ups. Most companies have fixed this issue, and now promote some kind of email offering. Unfortunately, in my experience, most corporate e-newsletters range from boring to terrible. Think about these questions: Is your e-newsletter amazing? Is it truly helpful? Is it targeted to one audience? Today your e-newsletter is more important than ever … you need to treat it as such. That may mean you need to kill your current newsletter and create real value from the ashes. In almost all cases, content marketers are doing too much. Creating too much content, in too many ways, without getting the results they would like to see. I recommend killing something that isn’t driving results. Put that time and effort into something that is working and make it even better. A few years back, Xerox identified a disconnect between marketing and sales. Specifically, the salespeople didn’t know and didn’t care about what the content marketing team was creating and distributing. The solution? Xerox developed a content marketing program specifically for the sales team, which culminated in a weekly email wrap-up to salespeople that included strategies to leverage content that would help them drive sales. If your sales team isn’t leveraging your content in some way, it’s your fault, not theirs. Fix it. This article by Gary Vaynerchuk makes a solid case for audio. If I was to start a content platform today to build an audience, audio would be my first choice. Why? First, usage is up and starting to accelerate. Second, major content gaps still exist in audio, unlike text-based content and video. Third, audio is the only type of content where the audience can multitask. Start working on a book for your business. Yes, a real, printed book. If you want to be the leading expert in your industry, a book can pave the way for speaking opportunities, guest posts, surprise coverage, and blog posts to fill a year. Get at least five employees who are not in marketing involved in your weekly content plan. Develop a content marketing metrics plan for your CEO or supervisor that includes only those metrics that make the case for company business objectives. If you have the budget, identify media companies in your industry that may be ripe for acquisition. Develop a customer event that doesn’t talk about your projects but educates them on where the industry is going. Whatever you do this year, make sure you are telling a story that’s different than everyone else’s in your industry – not just the same story told incrementally better. Here’s hoping that there is at least one golden idea in this mix that will help you finish strong for 2017. Want one more idea to boost your content marketing program in 2017? Register today for Content Marketing World, Sept. 5-8, in Cleveland, Ohio. Use the code BLOG100 to save $100.